Chris Osborne: "That was an intriguing picture of Paul Newman leaning on Old 16." Chris Osborne: "I have attached a photo of my large painting of Paul with the Bob Sharp #33 Datsun. I created it as a showcase for this year's Lime Rock Historic Weekend. When I photographed the car at Bob Sharp's house, I felt it was natural to have my model take the pose. I love the fact that from what you sent out I must have subconsciously realized that a pose like that was natural for Paul. Thanks!" Until his death on Sept. 26, 2008, Paul Newman was as well-known for his altruism and humanitarianism as he was for the cool blue eyes that helped to make him a mega-star of the 20th-century cinematic world. Now, two years later, that star power is again being translated into help for a public service operation, Survive the Drive, which helps teens learn safe driving tactics. Survive the Drive presenter, Bob Green, a race car driver and instructor at the Skip Barber Racing School at Lime Rock Park, has presented programs to more than 15,000 high school students throughout Connecticut, Massachusetts and New York during the 2009-2010 school year, and has reached out to 70,000 young people since 1996. 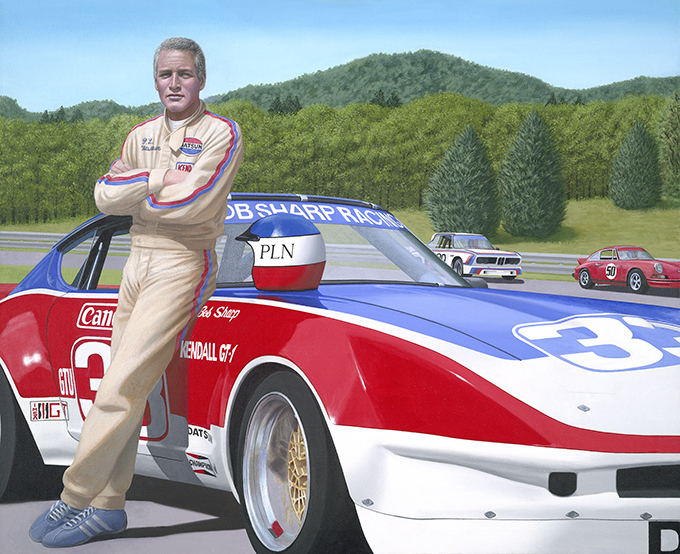 To help fund the costs of his presentations, Mr. Green has collaborated with New Milford automotive artist Chris Osborne to create a large-scale portrait of Paul Newman, who was an avid auto racing enthusiast for 40 years. The picture will be offered for sale during the Vintage Festival at Lime Rock Park over the Labor Day weekend, Sept. 3-6. A portion of the sales price will benefit Survive the Drive. Artist Chris Osborne was shown here with the #33 Datsun on the day she visited Bob Sharp's Connecticut home. She was holding Paul Newman's helmut and wearing one of his jackets. More information on Chris Osborne's beautiful artwork can be found at www.ChrisOart.com . Take the Long Island Business News Poll: With the ski mountain project all but dead, what should Riverhead do with the EPCAL land? As of 7:30 PM, Tuesday, November 16, 2010: 82% of the 1,668 people who have voted selected "Build a motorsports complex", followed by "Build a casino" (5%), "Open Disney World Long Island"(5%), "Create a sports complex with a new home for the Islanders" (3%), "Turn it into an airport (2%), "Build an equestrian complex"(2%) and "Build another mall" (0%). Over 65 comments have been posted.